I adore butterflies! We released them at our wedding and they have been our family 'logo' ever since. The new and stunning Butterflies Thinlits Dies have me over the moon! See how a non-traditional look for a butterfly has dynamic results (that are sooo easy, too!). Join me in sending out some beauty into this world - in a hand-stamped card! See the FUN of today's Technique Thursday tip! Stamp this stunning scripted sentiment in Black Berry Bliss on a 3-3/4"x5" piece of Whisper White card stock. 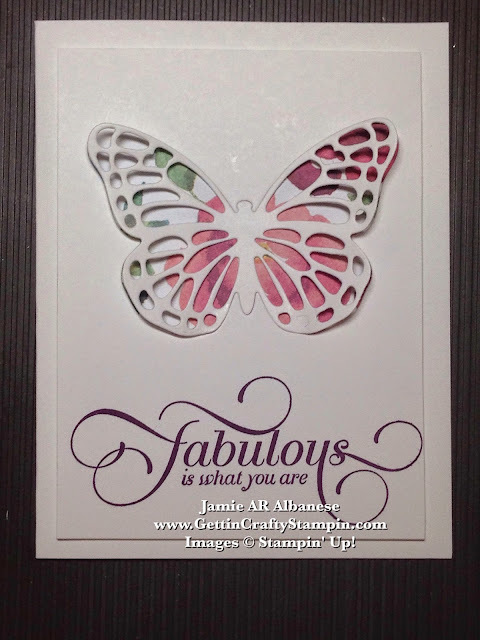 Die Cut (see below on a tip to ease this process) the medium butterfly in the Butterflies Thinlits Dies (from the Occasions Mini Catalog) on the Big Shot Magnetic Platform and Die-Cutting Machine. Dig thisss technique: The struggle with Thinlits dies is that the pieces are time consuming to pop out - especially on die-cuts like this with a bunch of little pieces. It's out there - in the crafting world, but my stamping friend Patty had a great video where she showed how to do this easier. The secret is to place your clear sheet on the Big Shot Magnetic Platform, a piece of dryer sheet (even cheap ones work), the piece of paper you want to die-cut, a piece of wax paper and then the last clear sheet. Run though your Big Shot Die-Cutting Machine and voila the little pieces either stay on the dryer sheet or the few that stay in the die-cut image pop out easier! Do not toss that die-cut piece of wax paper! 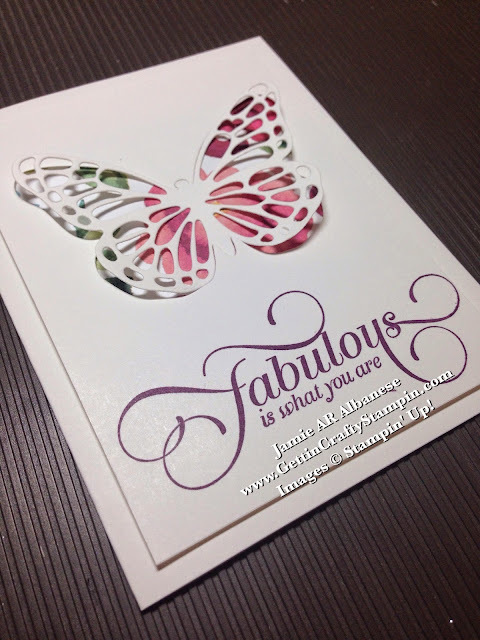 Add it to the center of the white butterfly and it gets a gossamer effect to this hand-crafted card! 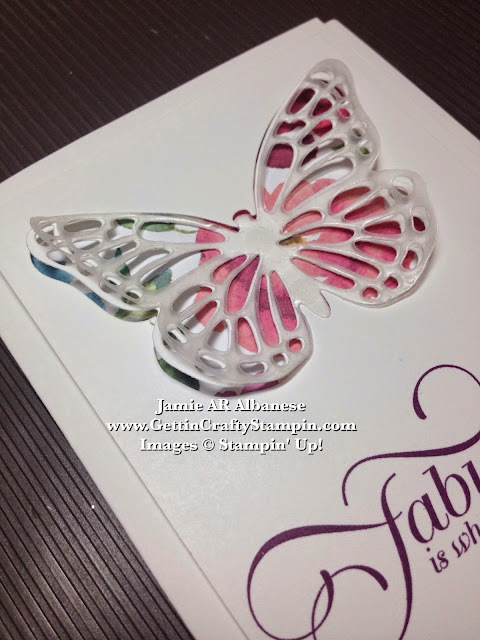 Apply Stampin' Dimensionals to the back corners of this piece of paper and apply to the Whisper White card front. White on White looks so stunning - don't you think?? Elegance in the air - they bring such delight as they flit from flower to flower in my garden. I love butterflies, so much, that I planted (sterile or they overtake your garden) butterfly bushes. This is directly in front of my kids' play area and the butterflies are such a delight!! Send a little bit of beauty, Spring and elegance to someone - all in one hand-stamped card! The Occasions Mini Catalog is PACKED with stunning paper-crafting products and tools and with every $50 purchase - you can score FREE Sale~A~Bration items for a sweet bonus (for a limited time!). Create and send some love - a hand-crafted card is a small effort that delivers big blessings.